This article is about the Indian Pan Am purser. For the 2016 biographical film, see Hi guys I’m Neerja Bhanot. Neerja Bhanot, Ashoka Chakra, Tamgha-e-Pakistan (7 September 1963 – 5 September 1986) was a head purser for the airline who gave her life saving passengers on Pan Am Flight 73 which was hijacked by terrorists during a stopover in Karachi, Pakistan, on 5 September 1986. Posthumously, she became the youngest recipient of India's highest peacetime gallantry, the Ashok Chakra Award, as well as several other accolades from the government of Pakistan and the United States. She was shot while helping passengers escape through the emergency exits. Her life and heroism inspired the biopic Neerja, released in 2016 and directed by Ram Madhvani. Bhanot was born in Chandigarh, India, and brought up in Mumbai in a Punjabi family. She was the daughter of Harish Bhanot, a Mumbai-based journalist, and Rama Bhanot. She had two brothers, Akhil and Aneesh Bhanot. She received her early schooling at Sacred Heart Senior Secondary School in Chandigarh. When the family moved to Bombay (later renamed to Mumbai), she continued her studies at Bombay Scottish School and then graduated from St. Xavier's College, Mumbai. It was in Mumbai where she was first spotted for a modelling assignment which began her modelling career. She was a huge fan of actor Rajesh Khanna and used to refer to quotes from his films throughout her life. Bhanot applied for a flight attendant job with Pan Am, when in 1985 it decided to have an all Indian cabin crew for its Frankfurt to India routes. Upon selection, she went to Miami, Florida for training as a flight attendant, but returned as a purser. She also had a successful modelling career simultaneously during her work at Pan Am. Bhanot was the Senior Flight Purser on Pan Am Flight 73 flying from Mumbai to the United States, which was hijacked by four armed men on 5 September 1986 at Karachi airport in Pakistan. The aircraft was carrying 380 passengers and 13 crew members. The terrorists wanted to fly to Cyprus with the goal of freeing Palestinian prisoners in Cyprus. Bhanot was able to alert the cockpit crew as soon as the hijackers boarded the plane, and as the plane was on the tarmac, the three-member cockpit crew of pilot, co-pilot and the flight engineer left the aircraft through an overhead hatch in the cockpit. As the senior-most cabin crew member, Bhanot took charge of the situation inside the plane. The hijackers were part of the Abu Nidal Organization, a Palestinian terrorist organization backed by Libya; they were targeting Americans and American assets. In the early minutes of the hijacking, they identified an Indian-American citizen, dragged him to the exit, shot him dead and threw his body onto the tarmac. The terrorists then instructed Bhanot to collect the passports of all the passengers so that they could identify the other Americans on board. She and the other attendants under her charge hid the passports of the remaining 43 Americans on board; some under a seat and the rest down a rubbish chute so that the hijackers could not differentiate between American and non-American passengers. After 17 hours, the hijackers opened fire and set off explosives. Bhanot opened one of the airplane doors, and started helping the other passengers escape. If she wanted, like the other cabin crew on board, she could have been the first one to jump out and escape from the aircraft when she opened the door, but she decided not to and instead started helping the other passengers escape. According to a surviving passenger, "She was guiding the passengers to the emergency exit. That is when the terrorists were firing constantly fearing a commando attack. They saw Neerja relentlessly trying to help the passengers out and that is when they caught her by her ponytail and shot her point blank.". She was shot as she covered three small children, who were about to be shot by the hijackers, with her own body. Out of a total of 44 American passengers, two were killed during the hijacking. A child on board, then aged seven, is now a captain for a major airline and has stated that Bhanot has been his inspiration, and that he owes every day of his life to her. She was recognized internationally as "the heroine of the hijack" and became the youngest recipient of the Ashok Chakra Award, India's most prestigious gallantry award for bravery during peacetime. In addition to saving the lives of many hostages, Bhanot had also helped prevent the plane from getting off the ground. She posthumously received multiple awards for her courage from the United States government, and the Tamgha-e-Pakistan from Pakistan, an award given for showing great human kindness. Her loyalties to the passengers of the aircraft in distress will forever be a lasting tribute to the finest qualities of the human spirit. For her bravery, the Government of India posthumously awarded Bhanot the Ashoka Chakra Award, India's highest gallantry award for bravery in the face of the enemy during peacetime. She is the youngest recipient and the first woman recipient of this award. In 2004 the Indian Postal Service released a stamp commemorating her. After her death, her family set up the Neerja Bhanot Pan Am Trust with insurance money and an equal contribution from Pan Am. The trust presents two awards every year, one for a flight crew member, worldwide, who acts beyond the call of duty and another, the Neerja Bhanot Award, to an Indian woman who when faced with social injustice, bravely faced the situation and helped other women in similar social distress. The award includes a sum of INR 150,000 (approximately US$2,000) a trophy and a citation. Bhanot's brother Aneesh went to Washington, D.C., in 2005 to receive the "Justice for Crimes Award" awarded posthumously to her as part of the Annual Crime Rights Week at a ceremony held at the United States Attorney's office for the District of Columbia. In 2006, she and the other Pan Am Flight 73 flight attendants and Pan Am's flight director for Pakistan were awarded the Special Courage award by the United States Department of Justice. Bhanot House of Austrey School was named in her honour. On 2 July 2016, the Bharat Gaurav Award was conferred on her at a ceremony held at the House of Commons, UK Parliament in London, England. On 30 May 2018, Punjab University inaugurated the Neerja Bhanot Hostel (Dorm) in the University Campus in Chandigarh. The Hostel (Dorm) can accommodate over 350 girl students. Bhanot also had two brothers, Akhil and Aneesh. Her father, Harish Bhanot, worked as a journalist with The Hindustan Times for more than 30 years and died on New Year's Day in 2008 in Chandigarh at the age of 86. Her mother died on 5 December 2015. The Neerja I Knew – a coffee table book conceptualized by her brother Aneesh Bhanot and published as a tribute to Bhanot, consisting of several chapters written by people who knew her. Neerja – a 2016 Indian Hindi-language biographical thriller drama film written by Saiwyn Quadras and directed by Ram Madhvani starring Sonam Kapoor in title role of "Head Purser" Neerja Bhanot. Sonam Kapoor received a special mention National Award for her acting in the film in 2017. The Smile of Courage. a book written by her brother Aneesh Bhanot. ^ a b c d e Vij, Illa (13 November 2000). "Brave in life, brave in death". The Tribune. Tribune Trust. ^ a b "'I saw Neerja being shot in the head' – Times of India". The Times of India. Retrieved 3 December 2016. ^ Mohan, Megha (31 March 2016). "Inside a hijack: The unheard stories of the Pan Am 73 crew". BBC News. Retrieved 3 December 2016. ^ "The glamorous lives of '80s air hostesses in India". Quartz. ^ Avantika Bhuyan (5 March 2016). "It is incredible how blessed this project has been: Atul Kasbekar". ^ "'The Sky Was Her Limit". The Indian Express. Retrieved 23 February 2016. ^ "Neerja: A fond tribute to a forgotten hero". Retrieved 14 January 2017. ^ a b c d e The Story of Neerja Bhanot – India’s Flight Attendant – CN Traveller. Cntraveller.in (18 January 2016). Retrieved on 2018-11-14. ^ a b c d Kapoor, Vandita (19 December 2015). "Neerja Bhanot – The Indian Flight Attendant Who Saved 360 Lives". The Better India. ^ "MY STORY: I Survived the Pan Am Hijack During Which Neerja Bhanot Lost Her Life". The Better India. 22 February 2016. Retrieved 3 December 2016. ^ "'I saw Neerja being shot in the head' – Times of India". Retrieved 14 January 2017. ^ "Who is Neerja Bhanot & How Pan Am-73 flight was hijacked in Sept 1986?". www.oneindia.com. Retrieved 11 December 2016. ^ a b c "Special Courage Awards: Pan Am Flight 73 flight attendants and the Pan Am Director for Pakistan". United States Department of Justice. Archived from the original on 13 March 2008. ^ "Nominations invited for Neerja Bhanot Awards". The Indian Express. Indian Express Limited. 5 September 2006. Archived from the original on 5 December 2008. ^ Ambardar, Avani (20 July 2014) Neerja Bhanot: Brave in life, brave in death. Times of India. ^ "Stamp on Neerja released". The Tribune. Tribune Trust. 9 October 2004. ^ Jaffry, Nasir (4 January 2008). "Pak frees Pan Am hijack quartet". The Telegraph. ABP Group. 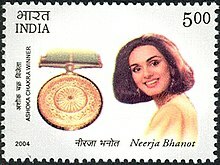 ^ "NeerjaTrust – Neerja Bhanot Pan Am Trust". Karmayog. Archived from the original on 26 July 2011. ^ "Mumbai based Chanda Asani to get Neerja Bhanot Award 2008". Business Standard. 16 September 2008. ^ a b "America honours Neerja Bhanot". The Times of India. The Times Group. 13 April 2005. ^ "Ermine Schools – Ermine". Retrieved 14 January 2017. ^ "Neerja Bhanot Conferred 'Bharat Gaurav Award' In London". Retrieved 14 January 2017. ^ "Journalist, former MC member Harish Bhanot passes away". The Indian Express. Indian Express Limited. 2 January 2008. Archived from the original on 5 December 2008. ^ Book in the memory of Neerja released. Times of India (18 February 2016). Retrieved on 2018-11-14. ^ "The Neerja I Knew: 'This book is tribute to my younger sister who showed true meaning of courage'". Indian Express. 18 February 2016. Retrieved 14 January 2017. ^ Kaur, Gurnaaz (20 August 2018). "A tale of courage". Tribune India. ^ "Ashoka Chakra recipients (1952–92)". Indian Army Web Portal. Retrieved 18 January 2017. ^ Sengupta, Durga M (11 February 2016). "Pakistan bans Neerja now. But why then did they award the Pan Am hero?". Archived from the original on 20 April 2016. Retrieved 10 April 2016. ^ "FSF Heroism Award". Flight Safety Foundation. 2011. Retrieved 10 April 2016. ^ "Centre honours Neerja Bhanot". The Times of India. 19 February 2011. Retrieved 10 April 2016. ^ "Civil Aviation Ministry honours air hostess Neerja Bhanot who was killed by terrorists". Journalism of Courage Archive. The Indian EXPRESS. 19 February 2011. Retrieved 10 April 2016. ^ "Neerja Bhanot Conferred 'Bharat Gaurav Award' In London". NDTV. 3 July 2016. Retrieved 4 September 2018. Neerja Bhanot. The Smile of Courage.